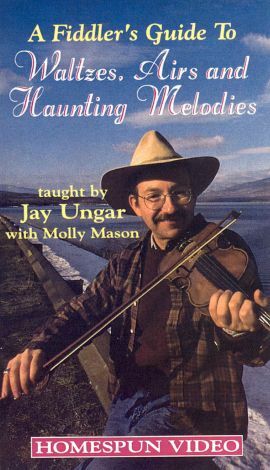 Super fiddler Jay Ungar brings his Grammy-winning stylings to this unique instructional video. With his innovative use of slides, grace notes, vibrato, rolls, and special bowing techniques, Ungar directs wide-eyed pupils on how to turn ordinary fiddle compositions into boot-stomping skirt-twirling free-for-alls. Any self-respecting fiddler will get a kick out of his takes on such classics as Shebag Shemor, South Wind, Give Me Your Hand, and his now famous composition for Ken Burns' PBS documentary The Civil War, Ashokan Farewell.